I got 6th place running a total of 84 km in the Kedah 12 hour run , 4 or 5 other people got 84 km too but I'm not sure how they count for me to get 6th . 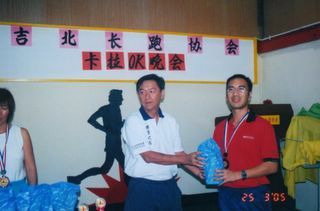 The 1st place was 105km, 2nd place 91 km , 3rd place 87km and 4th to 8th place got 84 km . Kedah 12hour Run Race -6th placing !! (3/3/05)-Got A Timex at last ! !